And it's off to Bluebonnet Hills! After mom's chemo treatment on Thursday, that's where we headed. Now, just some background before we begin, in case you're not familiar with this Texas beauty. The pretty bluebonnet is the Texas state flower. 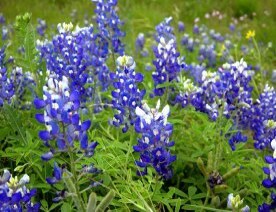 When the spring rains come, bluebonnets blanket the hillsides. It's absolutely beautiful. And it's tradition to get your picture taken, at least once, sitting in the middle of a field of bluebonnets. And so, mom and I headed to Bluebonnet Hills. As in the Bluebonnet Hills Memorial Park and Funeral Home. Not a bluebonnet in sight. Of course, it is the middle of summer and the heat is blistering. Perhaps in April, we'd have more luck finding a field of bluebonnets. But, as you may have guessed by now, we weren't there looking for flowers. We had a date with the director. Mom has been mulling over final arrangements in her mind for a while now. Terminal illness has a way of clarifying priorities. And this is one issue she felt needed to be handled, decided on, and done with. And so, we tackled it head on. Difficult yes, but somehow necessary and practical as well. Mom attacked it with her usual pluck and humor. And that's good, because if we weren't laughing, we'd be crying. And, here, let me just say, that mom's health is still very stable. The doctor is pleased with her progress and is cautiously optimistic. No talk of hospice or palliative care at all. So, please don't be discouraged. Mom isn't. Both mom and dad decided years ago that they wanted to be cremated. One decision down. But where to go with the ashes? How many of us laughed over the scene in "Meet the Fockers" where Grandma's urn was knocked off the fireplace mantle, scattered all over the rug and used hilariously inappropriately by the cat? Not good. Mom does not want to be displayed over the fireplace. So, we started checking things out and found that there is a rather unique way to memorialize the cremated remains in what is known as a columbarium. This is a permanent structure made up of spaces or niches where the urn can be placed. A marble or bronze plaque is then used to memorialize the loved one. Enter Bluebonnet Hills. 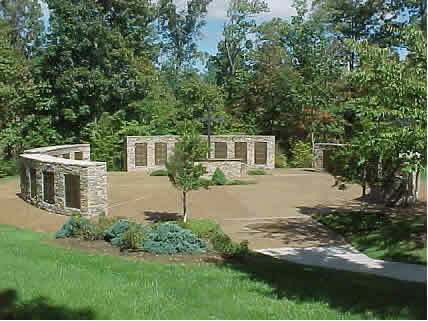 They have a variety of columbaria and we decided to check it out. A little intimidating at first to walk into a funeral home, but we were on a mission. I think the director was a little nonplussed when he saw our notebooks out and camera ready. But nonetheless we got an education. No decisions made exactly, but we do have more questions. Like, should mom and dad be buried in the same niche, or would separate niches, side by side be best? Mom wasn't sure dad could handle the close proximity for all eternity. And we laughed. And the director looked startled. And by the time we finished the tour, we were able to talk quite freely about graveside committal services, death certificates, fake flowers, and respectful memorial tributes. Not everyday that you grapple with these things, but mom offered this thought. She sees this as her final gift to us, her family. By making sure these decisions are made and finalized now before the end nears, we know that her wishes will be followed. And that does give peace. Odd to realize, but it does. The grief will come and I know it will swamp us, but these decisions lay a path for us to walk when we won't be able to see for the tears. 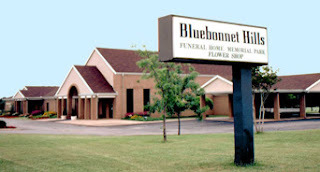 And I will remember the way we laughed at Bluebonnet Hills, and it will make it easier to bear. Only One Seriously Ill Person at a Time, Please!